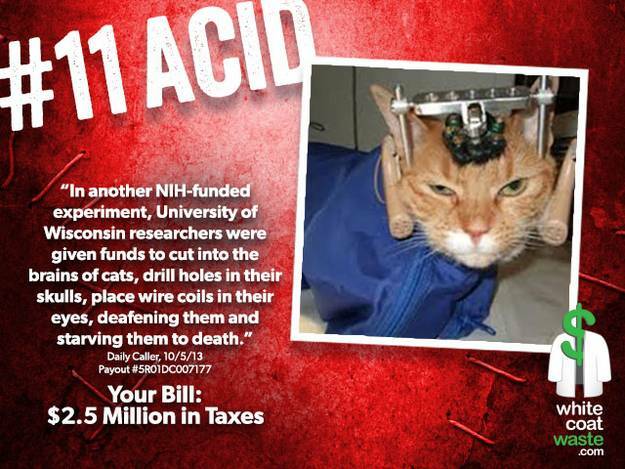 Every year the government spends over $12 BILLION OF YOUR TAX DOLLARS on animal experimentation. 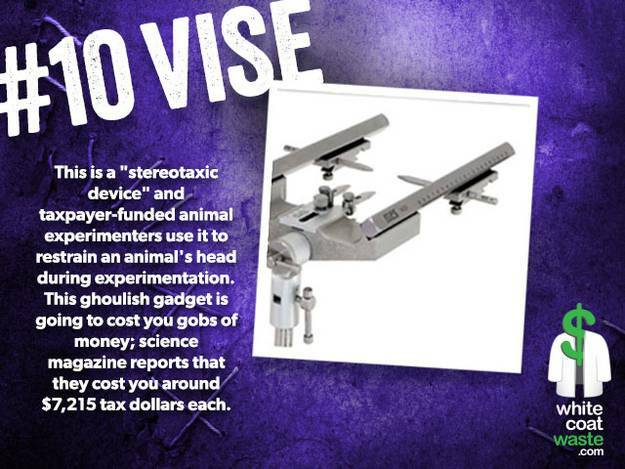 So just in time for Halloween, we’ve compiled a list of the top 13 horrifying instruments of misery that you bought. 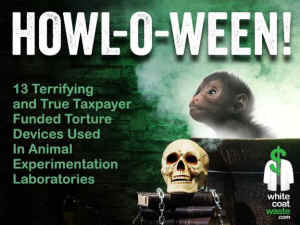 Your tax dollars at work, in no particular order … drum roll please! 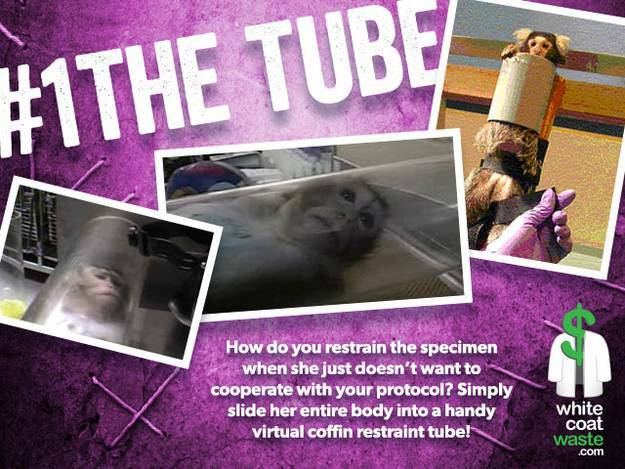 That’s right, as described by the Journal of the American Association for Laboratory Animal Science: “An animal is hand-caught and placed into the plastic or metal tube, which encases the body’s trunk to hold the animal in place.” Simple enough. 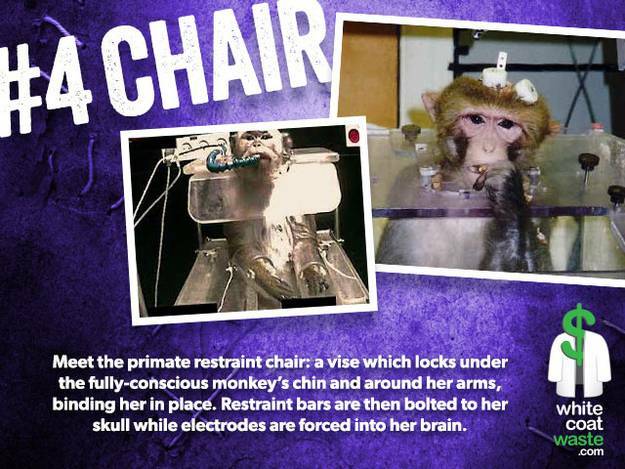 Or as another textbook for experimenting on animals puts it: “Restraint tubes allow easy weighing and bleeding of juvenile or African green monkeys … they severely restrict any animal movement.” Indeed. 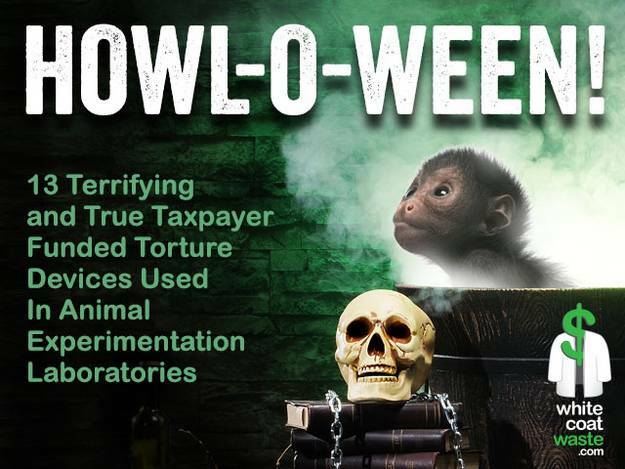 For over 30 years the government has handed out your money to Professor Marilyn Carroll at the University of Minnesota to addict monkeys to heroin, Angel Dust, cocaine, crystal meth - and, in turn - forcibly withdraw them from these street drugs. Your bill? Over $3.6 million tax dollars … just in the last decade alone! (payout #5R01DA002486). 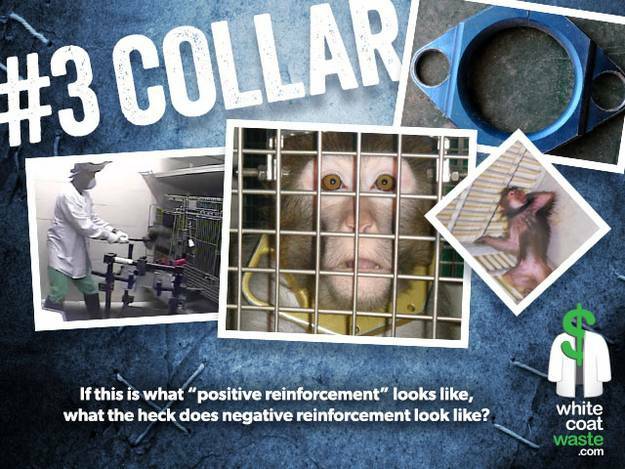 If this is “positive reinforcement,” what the heck does “negative reinforcement” look like? 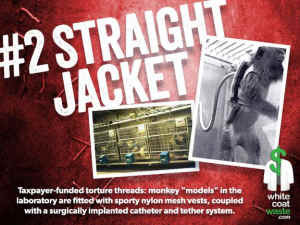 As a manufacturer boasts in its sales catalog: “The Neck Plate attaches around the Yoke Base Plate on both the macaque and baboon restrainers and prevents the animal from raising its arms above its shoulders …the Waist Plates are designed to prevent the primate from having access to its lower body.” One vendor charges you upwards of $6,275 tax dollars for each chair! But that’s not all … optional à la carte customization includes footplates to administer painful and frequent electric shocks on the soles of her feet while she’s fully restrained. Almost gives new meaning to “electric chair,” doesn’t it? 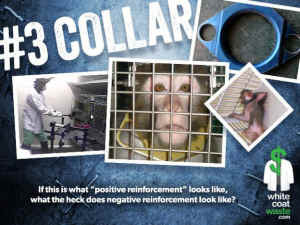 In fact, some of these experiments are so painful that the only way to force the primate to “cooperate” is through prolonged water deprivation for up to 23 hours per day. Forget the new iPhone 5s. Forget the new iPad Air. 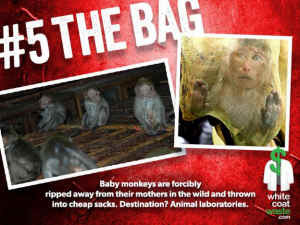 This season’s hottest import from China may just be the rhesus macaque! You see, laboratory primates don’t grow on trees. No worries. Today’s taxpayer-funded professor goes directly to the source. 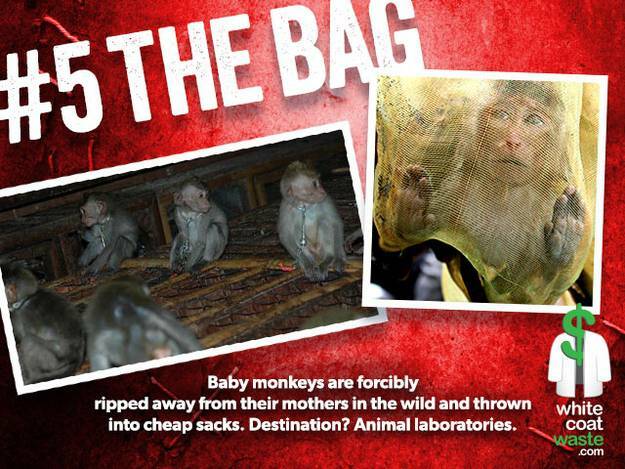 These baby monkeys are physically ripped away from their mothers in the wild and thrown into a cheap sack. Destination? The laboratory. Meet Shiva. At the taxpayer-funded Oregon National Primate Research Center, Shiva is forced to eat only sugary drinks and fatty foods. 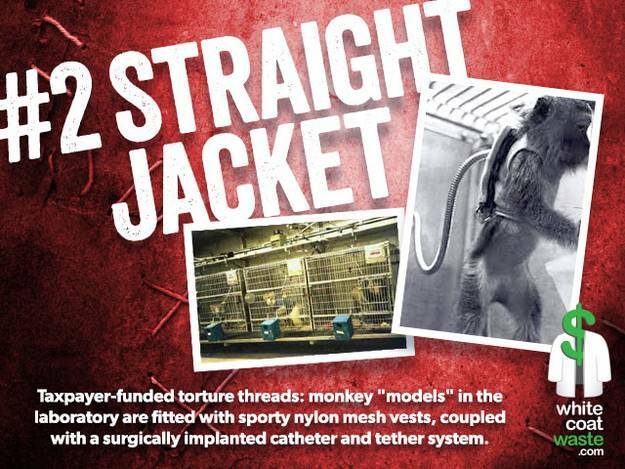 Shiva weighs more than twice her normal body weight and lives alone in a cold, wire-mesh cage. Shiva receives no exercise or interaction with other monkeys. After the government study is finished, Professor Kevin Grove will kill Shiva and dissect her brain. The point of all this? 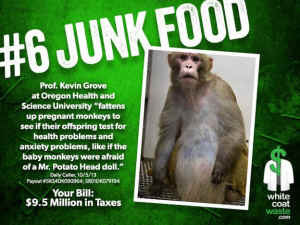 Professor Grove will “fatten up pregnant monkeys to see if their offspring test for health problems and anxiety problems, like if the baby monkeys were afraid of a Mr. Potato Head doll.” Your bill? Over $9.5 million in taxes. (payouts #5R24DK090964 and #5R01DK079194). 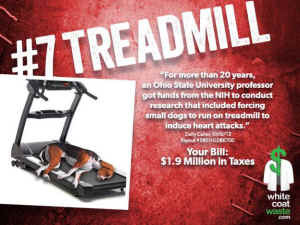 We’ve all said it: “exercise is torture.” But could it actually be used as a torture technique in the animal laboratory? Well, several sadistic “scientists” are cashing your checks to find out! In 2009, Queenie, a Michigan dog, was found stray by residents of Gratiot County who kept her for weeks before bringing her to the local animal shelter. She was subsequently brokered to Wayne State University for tortuous treadmill experiments that lasted over a year. One of the laboratory bureaucrats noted that Queenie was “acting very timid – like she can’t get [up]…shakes while getting up (back legs)… won’t get up for me.” For the next two weeks, Queenie was seen “tip-toeing” and limping, but she was still forced to run until her demise. You paid the bill (payout #5R01HL055473). 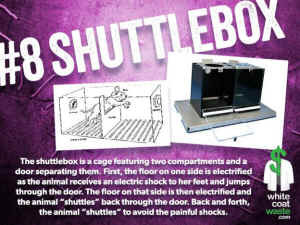 The shuttlebox is a cage featuring two compartments and a door separating them. 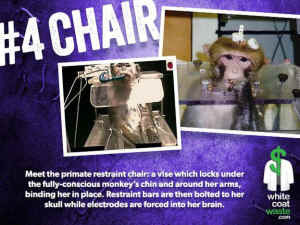 First, the floor on one side is electrified as the animal receives an electric shock to her feet and jumps through the door. The floor on that side is then electrified and the animal “shuttles” back through the door. Back and forth, the animal “shuttles” to avoid the painful shocks. 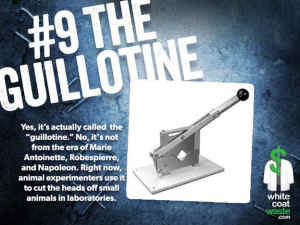 Meet the guillotine, and yes, it’s actually called the “guillotine.” No, it’s not from the era of Marie Antoinette, Robespierre, and Napoleon. 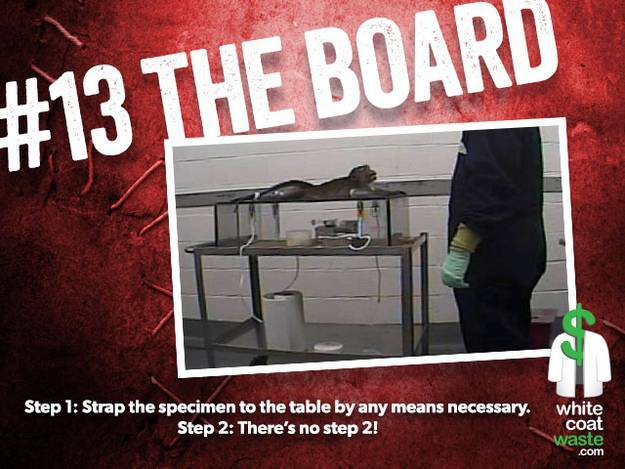 Right now, animal experimenters use it to cut the heads off small animals in laboratories. But don’t take our word for it. 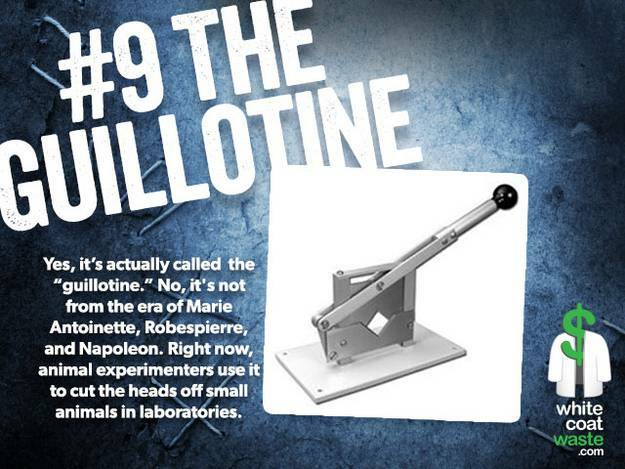 As written by the manufacturer: “The decapitator cuts cleanly and quickly through bone and tissue.” This particular vendor charges you $893.00 … for each guillotine! On April 15, taxpayer-funded “white coats” are going to party like it’s 1789! Do you recognize this? You should, because you bought it. It’s a stereotaxic device and taxpayer-funded animal experimenters use it to restrain an animal’s head during experimentation. 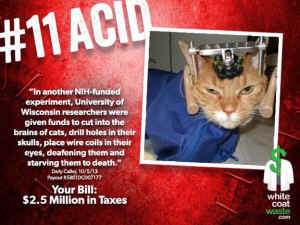 Right now, at the University of Wisconsin-Madison, taxpayer-funded “white coats” are applying acid and other chemicals in cats’ ears to forcibly deafen them (payout #5R01DC007177). Number of Cures? Zero. Your bill? $2.5 million in taxes. Metzenbaum. When only the best will do, you go with fine European engineering (paid for with your American tax dollars, of course). Metzenbaum. But these aren’t ordinary office scissors. “Manufactured from stainless steel; hardened, tempered, and polished for a high-priced finish without the added cost.” Metzenbaum. Beagles are the most widely abused dogs in animal experimentation and they are routinely de-barked with these sadistic scissors as puppy dealers frequently rip out the happy little hounds’ vocal cords. 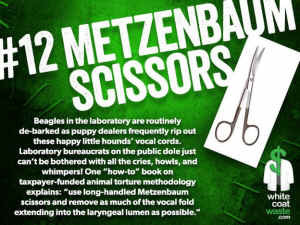 Laboratory bureaucrats on the public dole just can’t be bothered with all the cries, howls, and whimpers! Truly, in the laboratory, no one can hear you scream. When gruesome gears and gizmos just won’t do, simply go old school and tie the animal down by any means necessary! Step 2: There’s no step 2!